Yunnan Green Tuocha known in China as "raw" Tuocha, it was produced by the Xiaguan Tea Factory, prepared by using leaves from the improved broad-leaf tea species. 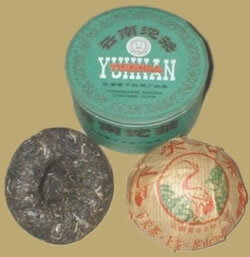 The tea is of a bowl-shaped mass of leaves, regular in shape tightly-compressed, with shinny luster and strong scent. It's liquor looks bright yellow, taste refreshing and sweet in aftertaste.